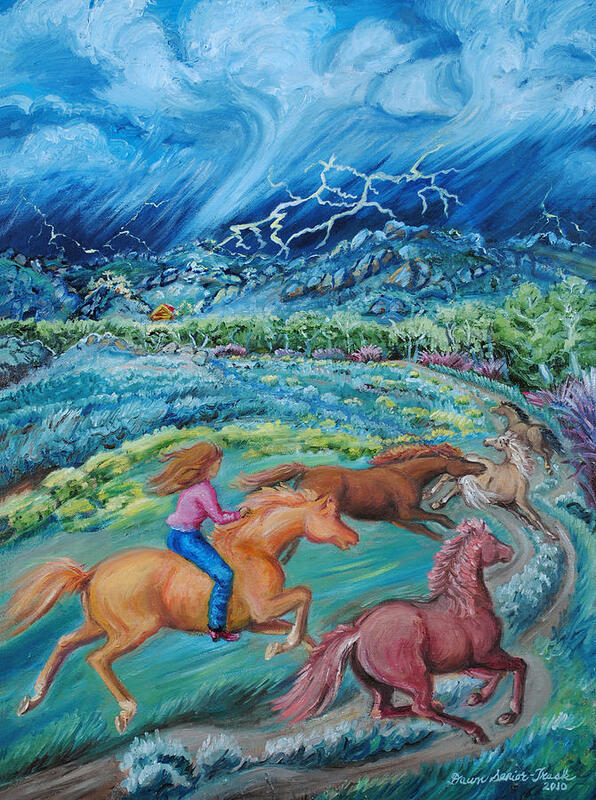 Racing The Lightning Home is a painting by Dawn Senior-Trask which was uploaded on October 7th, 2010. This oil painting is based on a sketch from my journal, describing a hair-raising ride. I'd walked from the cabin to bring the horses in, when a thunderstorm blew up -- Wyoming's weather can change quickly. I managed to mount my mare Candy before the horses took off at a gallop, racing toward the cabin. Without saddle or bridle, I managed to stay on as we raced up the two-track, down the steep draw, across the creek and up the other side. I was thrilled and scared at the same time! 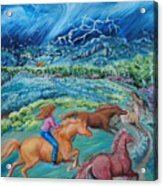 Being on a horse in a lightning storm is very dangerous. Candy galloped so fast toward the corral that I feared she was going to jump it, so Iyelled, "WHOA!" 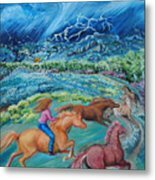 forgetting that Candy had been trained for reining competitions, in which the horse, at a sharp "Whoa!" slams on its brakes to a sliding stop. That would've thrown me off over the horse's head, but luckily Candy seemed to know better and slowed to a gentle halt. Whew! What a ride! 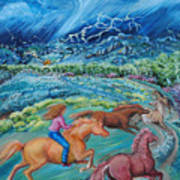 you are so talented Dawn such wonderful colour and technique and the movement so superbly depicted your Racing piece is so rich and so beautiful one feel transported into your beautiful world!! awesome!!! such rich colours and excitement and joy in the movement!! so love your vivid scene of life in Wyoming !! you create such beauties Daw wish I could comment a million times another vote for simply fantastic!! Thank you all so much for the wonderful comments and features! Much appreciated! fantastic movement love the energy and feel of this exciting piece and of course your magnificent rendering and style always bowls me over! love it fave!! Wonderful Description as well ! I so love this description! Candy is an incredible horse and you are an incredible artist! I feel as if I am right there in the storm.